If you follow me on Facebook, you might know that a few months ago I asked ladies who have been in difficult marriages to anonymously share their stories, and to share any "red flags" that they missed during dating life, which could have saved them the turmoil they experienced. We girls are often so good at explaining away "red flags" and defending boyfriends poor behavior. Yet it seems that so many friends I know who are divorced can look back and say "If only I had seen it then...."
Maybe, just maybe we can save some girls from going through the heartache of a bad marriage and divorce, by identifying some bad signs in dating life. By hearing others' stories, we can learn. The response I received was great. Stories came in from different states- women I know and women I don't know. They seemed eager to share their mistakes, in hopes of saving someone else from a similar fate. I'll be sharing a few of these stories in the next few days. "I was once married, and never recognized the red flags along the way that ultimately led to the end of that marriage. I pray that the daughter I am raising now learns to spot them better than I did! I saw some red flags, but I improperly viewed them as just challenges. I thought that our love would overcome these challenges and grow stronger instead. 1. I think the most substantial red flag that I deliberately minimized was the inequality of our faith. I was raised in a Christian home and my faith was, and still is, very important to me. I realized pretty early on in dating that my ex husband's faith was very surface, yet not totally nonexistent. He was raised in church and still attended, but didn't see it as much more than that. I viewed it as though I had been placed in his life to help lead him to a deeper faith. I assumed that he was attracted to that part of me and appreciated who I was because of my faith and values. I saw the red flag of our faith. I sincerely believed that although it was not as important to him as it was to me, that it would only get better because of our love. 2. I also noticed that he was very deceptive with his mother, but I chalked it up to her being a controlling busy body, not a necessarily a problem with his honesty. I would have never dreamed that someday he would behave the same way with me. Had I paid more attention at the time, I would have seen he behaved that way with other family members and people that we knew. It was not until after we were already married that I was able to see that dishonesty went well beyond his mother. He white-lied when the truth would have served him better. The deception, I never saw as a red-flag. It was an "unappealing act" that I made an excuse for, even though I didn't see how prevalent it really was until after we were married. I had no idea what exactly I was justifying. In my defense, if you knew his mother, it would have been easy for you too! Trust is essential to any relationship. Our marriage was irreparably damaged the first time he lied to me. I truly forgave him, but things were never the same between us. 3. When we were engaged, he was well aware that I wanted to be a homemaker (my mom was also) and I intended to homeschool. We were on the same page in this area. What I never took into consideration was that he was raised by a single working mother and his grandmother, in a very inconsistent home with little stability. His father had little to do with them and never contributed financially. He knew it was important to me and that it made so much sense, but he really had no idea what a home like that would be like. Eventually he grew to resent his role as breadwinner, despite the fact that it would have actually COST us money for me to work outside of the home. He began to resent everything about our life, including me. I knew that we were raised in different kinds of homes, with different values and experiences. I did not see this one as a red-flag. I trusted that we had talked enough about it as were up for the challenge. I do believe that when we women are in love, we overlook things that otherwise we would never tolerate. For example, I never saw his slovenly home as a huge conflict with my compulsive germaphobia and organization. He was just a sloppy bachelor-who I loved- in need of a woman's touch- who he loved. It turned out to not be as simple as that. 4. I believe the reason I missed SO many red-flags, or chose to ignore/rationalize them, was because I didn't want to admit that the man I fell for was not the man that would suit my deepest needs. I knew I loved him deeply, and he loved me too. I thought that because of that love, he would come to fulfill my needs, and I his. I believe another reason that I didn't see some of the red-flags, was that I was ignorant, or naive to some of my deepest personal needs. For example: I am very bookish, a bit of a nerd. I love art and intellectual pursuits. He was very physical, outdoorsy, and didn't like to read. This is a red-flag that I never saw. Our difference in intellect was a non-issue. I never saw myself as smarter than him, we were just smart in different areas. I was unaware how much I needed intellectual stimulation from my spouse. This matter became a source of great friction, as he (I later found out) had always felt below me. I needed a strong leader, a protector, a man that adored our home as much as me, a romantic, a man that could stimulate me intellectually, and that would carry our family spiritually. I never fully understood what his needs were (I don't think he even knew), but I was just as unable to fulfill his. 5. Lastly, I ignored the well intended (and unsolicited) input from one of my best friends. She just didn't see how he and I could possibly ever bridge our differences well enough to make a home together. I became very defensive and assumed she was just envious. I hope that my experience can be of use to someone else. My divorce was one of the most painful experiences I have ever traveled through, and one I never dreamed I would endure. But God is good and has restored all that I lost. My daughter and I have a very close relationship and I continue to homeschool. God taught me things I could not have learned any other way. Years later, He has brought a very special man into our lives. This time I am paying attention, I know myself better, and we have a great pre-marital counselor from our church. -pre-marriage counseling is wonderful and should be mandatory. Do it, and pay attention to what you learn. -how he treats the other women in his life matters (mom, sisters, ex mates/children's mothers, nieces, sisters-in-law, coworkers), so pay attention. -his values (and faith) must align with yours, so pay attention. -he will be a product of the environment/climate he was raised in, so pay attention to how he relates to his upbringing. -his dishonesty in areas that don't include you will one day include you, so pay attention. -if he already has children, watch how he treats them. There is a difference between physical distance and emotional distance. Pay attention for the latter. -his idea of home/family/roles needs to mesh with yours, so talk, talk, TALK about your future and pay attention! -he is who he is, not a project for you. Know what/who you are looking for in a mate, pay attention, and if he doesn't meet your needs AS IS, he isn't the one. -it is easy to be so caught up in the "in love" feeling that you grow blind to things that are obvious to your closest friends. They love you and will tell you, so ask them. Don't get defensive, and pay attention. 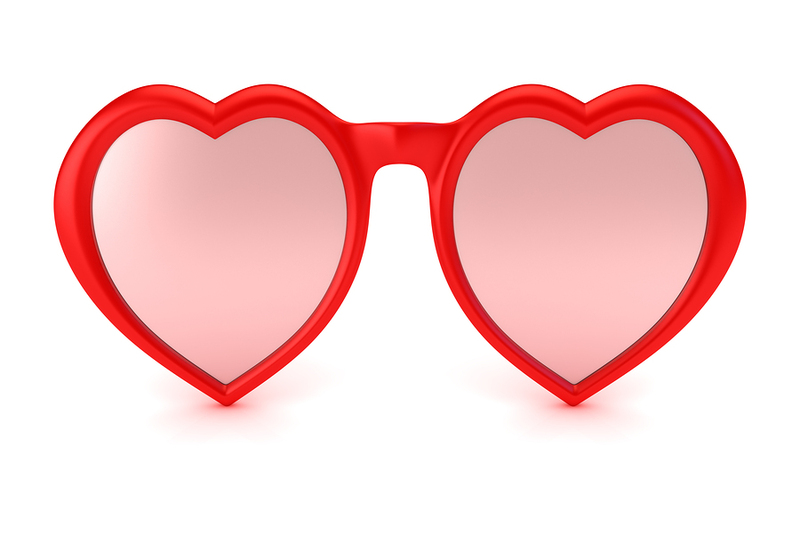 -pay attention because you are in a wonderful state of love, complete with rose colored glasses which make the flags almost invisible! And finally, a quote from Dave Barry (to his daughter who just began dating): "A person who is nice to you, but rude to the waiter, is not a nice person." Excellent post! I am forwarding it to my three daughters and my son! (all have "significant others" but are not married yet! Thank you Karen! I'm so glad you find it useful! Great Rachel! So glad these ladies are sharing their stories this week. I thought they would be so helpful to many.